If you’re not including CTA’s when building email campaigns, you may as well not send them at all! You should have goals in place and your email campaigns should be helping you achieve those goals. Whether that’s to drive more traffic to your website, increase ticket sales or increase sales of a particular product. Always include at least one call to action in your emails, otherwise your subscriber won’t know what you want them to do and therefore won’t take action. At the other end of the CTA spectrum, some marketers include too many. Including too many CTA’s in one email will confuse your subscriber- which one should they be doing? Keep it simple and limit your emails to just one or two CTA’s. Given that the majority of emails are opened on mobile nowadays, it’s absolutely vital that your emails look as good on mobile as they do on desktop. Send yourself a test email and open it on your mobile device as well as your desktop before hitting hitting send to your subscribers! Segmenting your email list is guaranteed to increase your open rate and click through rate because your subscribers are more likely to be interested in the content you’re sending as it’s far more targeted and personalised for them. You could segment your list based on industry, location, interests, age or gender for example. Click here for more on segmenting your email list for great results. if you don’t segment your list and you send bulk emails to your subscribers, your open rate is going to suffer because the majority of your subscribers will not be interested in the content you’re sending them. If you don’t clean your subscriber list on a regular basis, you’ll be spending time and money sending emails to inactive subscribers who aren’t and haven’t been engaged with your emails for months or even years. Keeping your list clean, improves your engagement rates and your bottom line because you’ll be marketing to those who are interested in your products or service. Sending from an email address like donotreply@ is a huge mistake- people buy from people and your subscribers want to know that they’re receiving communications from a person and not a computer. If your communications come from a personal email address, you’re more likely to be able to build a relationship with your subscribers and encourage engagement. If your emails aren’t worth opening, your subscribers will ignore them. We’re not saying that you should include a discount code in every email you send, but your emails should always offer value in some way or another. That could mean that they’re educational- and the value is in the lesson that you’re teaching or they could be entertaining or you offer a piece of content that will help your prospect in some way. 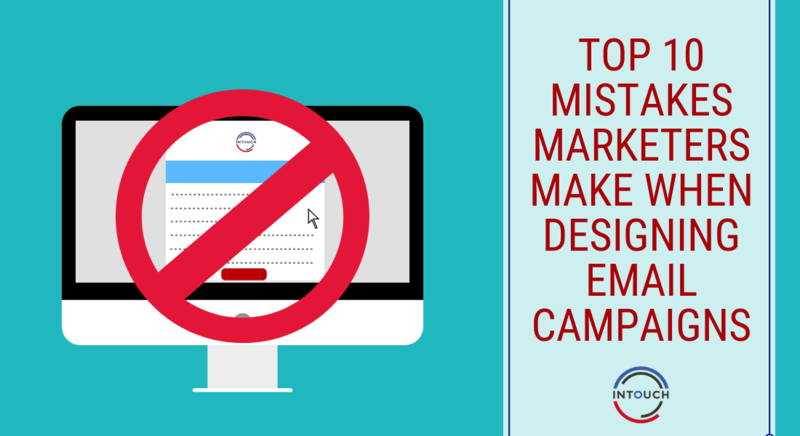 Sending emails inconsistently is a big mistake. As humans, we like consistency and reliability. If we come to expect an email at 8am on a Friday, we want it at 8am on a Friday every week. If this stops, we lose interest. So, send your emails on a regular basis and stick to it! This is one of the worst mistakes you can possibly make in email marketing. If your subscriber wants to unsubscribe, let them- they won’t be becoming a customer anytime soon if they don’t even enjoy the content you send them. Hiding the unsubscribe button, or making it difficult for your readers to unsubscribe, will only cause them to report your email as spam and you do not want that! Your subject line is the first preview your subscribers have of your email so make sure you get it right. Your subject line should be enticing, interesting and snappy to encourage your readers to open your email. (Click here for subject line best practices.) Another mistake some marketers make with regards to subject lines is not considering where their subject line will be cut off on different devices and this can cause some embarrassing mishaps! A great tool to help you with this is Zurb– Zurb allows you to preview your subject line on mobile devices to ensure you don’t make any mistakes. If you’re looking to improve your email marketing- we recommend you read this post for some great tools to help you- most of which are free! Or, take a trial of InTouchCRM and allow our system to do the hard work for you!